Recent graduate of the University of Southern California's Annenberg School for Journalism. Los Angeles Times business reporting fellow. MUMBAI, INDIA-- The bell rings, and nearly 700 Muslim students pour from Anjuman-I-Islam school's worn, stone buildings onto a dusty quad. Their plain, blue-and-white, government-sponsored uniforms mask the reality that 97 percent of these secondary school students come from ghettos, slums and illiterate families. Despite the energetic chatter and overflowing classrooms, most of these students' education will stop before they turn 15. Muslims make up almost 14 percent of India's vast population, yet remain the country's most disadvantaged minority and religious group. They rank lowest in literacy, more live in slums than any other group and less than 1 percent hold public sector and government jobs. "The separatism of Muslims gives them a lack of choice that makes them stay together in concentrated ghettos where there are not many state-sponsored schools," explained Irfan Engineer, director of the Center for Study of Society and Secularism. "Muslims just aren't in schools, comparatively." Statistics paint a dim picture, predicting that like most Muslims students in India, 40 percent of Anjuman's students won't make it past grade nine, the highest drop out rate of all religious and minority groups in India. "That's the age when their parents pull them to make money, or they see friends making 200 rupees a day and they think that's great," said Anjuman-I-Islam Director Sabina Zaveri. "But I tell them they can never make more than that once they drop out." Two hundred rupees add up to about three U.S. dollars. India is a secular country, but religious beliefs draw deep political lines. In a Hindu-dominated nation, Muslims have endured a riotous, bloody history that, according to a slew of reports, continues to leave a dark mark on India's classrooms. Poverty, communalism and segregation hinder Indian-Muslims' educational trajectory, including infrastructure and achievement. A groundbreaking 2006 report documented the extreme discrimination and deprivation faced by Muslims in India across all socio-economic scales. The Sachar Committee harped on the "deplorable conditions of Muslims" in terms of poverty, education and employment. A new study seven years later by the U.S. India Policy Institute concluded that Muslims have "not shown any measurable improvement," especially in education. "Nothing's changed from the government," scoffed Vibhuti Patel, the head of the Economics Department at the SNDT Women's College in Mumbai, who calls government assistance "meager" and Muslims' progress "marginal." The government of Maharashtra commissioned Patel and her colleagues to conduct a socio-economic profile of Muslims in the state last March. "Child labor is very high for Muslims," she said of her findings. "Most adults are manual laborers and unskilled workers and don't have opportunities to get good jobs because they are forced to support the family." India's Muslim community has the lowest college enrollment of any religion-based group in the country -- only 11 of every 100 Muslim students enroll in higher education. Muslims in rural India, where most of India's population resides, fare far worse. When it comes to putting food on the table, education falls several notches on the "vital scale." Yet, a 2010 report showed improved access to schools for children in predominantly Muslim areas, with drinking water, toilets and desks. "The mentality is slowly changing for the need to educate Muslims," said Zaveri, who cites the creation of more government-funded Muslim schools as a factor. Or, as Patel puts it: "Muslims' greatest crisis is no leadership. They are voiceless in all power structures." A wooden cricket bat drops to the dust as the school bell blares a second time. Hundreds of small shoes swarm and scatter in the quad -- passing period is over at Anjuman-I-Islam and the stone staircase fills as throngs of students rush to class. Like many Muslim schools, Anjuman-I-Islam is bursting at the seams. Students crowd into rundown, stark classrooms. Class sizes topple 60, with 23 teachers for nearly 700 students. This school, however, is considered luxurious compared to those in rural villages and ghettos. 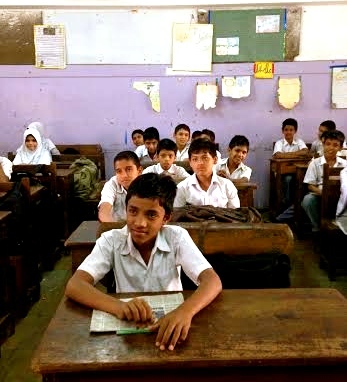 Anjuman is one of 4,785 Urdu-Medium schools in the state of Maharashtra, India's second largest. (Urdu is a language spoken in migrant Muslim communities). A recent push to create Urdu-medium schools addresses threats and discrimination that contribute to Muslims' shockingly low presence in India's educational system. But critics say funneling Muslim students into Urdu language schools hinders their path to a higher education, as they learn Hindu second and English third. "They have so many problems reading and writing because they learn it third," said Nasima Shaikh, one of Anjuman's English teachers. "They are very weak." Try scoring a coveted IT job or scholarship with shoddy English skills and so much else stacked against you, Engineer added. All Anjuman-I-Islam students' education is subsidized -- fees, books and meals are covered by government funds and trusts. Anjuman science teacher Nasari Kausar bends over a large, wood table cluttered with students' papers, old science equipment and books. Glancing over at her students quietly taking an exam, she lists off challenges. "You can see the difference between our school and private schools," says Kausar. "Many parents are not well in health and work so much they cannot be involved." Shaikh watches this unfold every day in her classroom. "It's nearly impossible to get parent cooperation," she shrugged. "They are illiterate and not interested in knowing about the kids' education." Shaikh's father pushed her to go as far as she could. She holds a bachelor's degree in English literature and another in English and geography. Growing up in Maharashtra, she knows holding not one, but two degrees is rare. Students who remain in school face much brighter prospects. "My class is 40 percent Muslim," said Vibhuti Patel, the head of the Economics Department at the SNDT Women's College in Mumbai. "Families are understanding education is a way out and are putting their children in co-education and throwing their girls into schools." "Most of my girls are first or second-generation learners," she added. 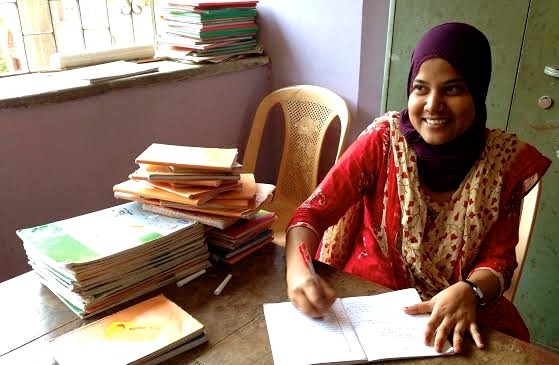 More Muslim girls now sit in India's classrooms, and they are scoring impressive marks on state exams -- a welcoming jump from a 2008 census that found 47 percent of Muslim women were illiterate. So far the political will to push for more improvements is not always there. "We have a body of work to do on our education system. Politicians have not done enough to get Muslims into schools," commented Meera Sanyal, a politician from India's Aam Aadmi Party running in the upcoming election. In Shaikh's dark, noisy classroom, the scarcity of Muslim politicians is a far-off concern to students trying to pass final examinations and move onto the next grade. Next to poverty, ensuring Muslim students pass through the school system "is one of the major bottlenecks in the education of Muslim children," according to the Centre for Equity Studies. There simply aren't enough teachers to catch the thousands that fall through the cracks. "I like to teach them individually, to solve their problems individually," said Shaikh. "But there are just so many." Shaikh asks her students what they want to be when they grow up. One slight, smiling girl in the front row timidly raises her hand. Pushing away from the wood desk, she straightens up in her chair and says she wants to be a flight steward. "She means a stewardess," Shaikh interjects. "Yes, a stewardess," the student quickly corrects herself. "I want to fly."